And so things had remained. 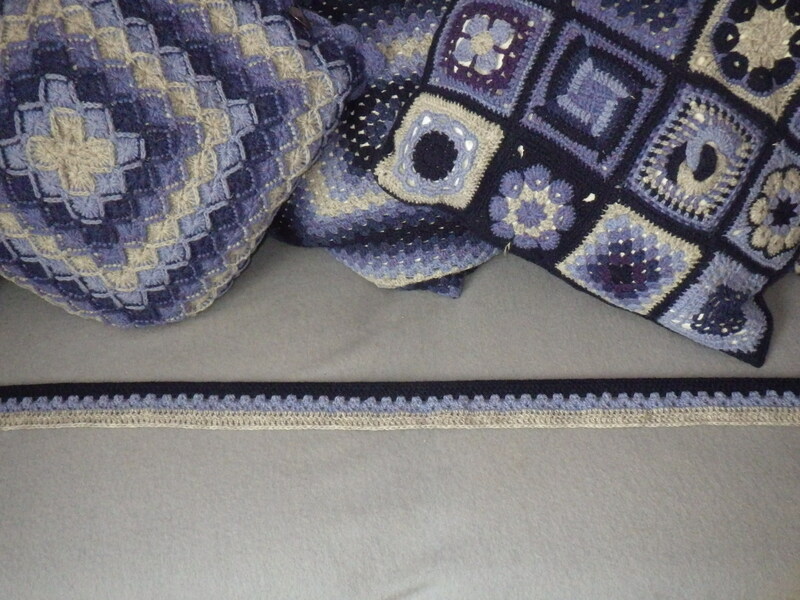 But in this week of recycling, upcycling, mending and generally making things last longer, I have been inspired to pick up my crochet hook again for the next stage of this project – namely a cover for the back of the sofa. However it’s easy and doesn’t require much thought, so is perfect to do whilst watching a film. If I’m honest, I’m pretty sure that I could have bought a whole new sofa for the same cost as all the yarn I’m going to need, but where would be the fun in that? In addition, I am trying to make the parts of the cover such that they can be used for other purposes when the main body of the sofa finally gives up the ghost. Maybe in another year we will have a completely revamped sofa, but at least now there are no exposed zips for Sam to consume. There is never going to be another sofa like it. Once the sofa is done, there are four dining chairs whose cotton covers have seen better days and a wicker chair that Sam is gradually removing the seat stuffing from. Eventually the whole house will be crocheted!! Isn’t that the most wonderful thing! I really must emulate you!! I like the rag rug idea… something I might have a go at in the future. I did wonder whether we’d be able to sit on it in the summer even here or whether that would be too hot, but it seems to be ok so far… not that we’ve had much hot weather. If I was in the tropics like you I’d probably have used cotton or bamboo yarn! When the time comes for me to re-cover our sofa, I’ll be using unbleached calico, which I can scrub, bleach, wring, hang in the sun and it’ll take any amount of punishment. I think this is going to be really neat when you finish. I am a slipcover person, myself, because I don’t crochet or knit. It’s nice to pull off one cover and put on another. And of course it HAS to have a cover because a friend whose decor accommodated cherry red plaid (atop a braided rug with some of the same colors) gave me the little couch. It’s a marvelous guest bed, but, like you, I knew something had to be done with it, even without dogs chewing up the zippers…. Ooh – cherry red plaid – that mush have been striking!! We had two identical sets of covers for this sofa originally, but over the years they’ve got rather battered and worn. 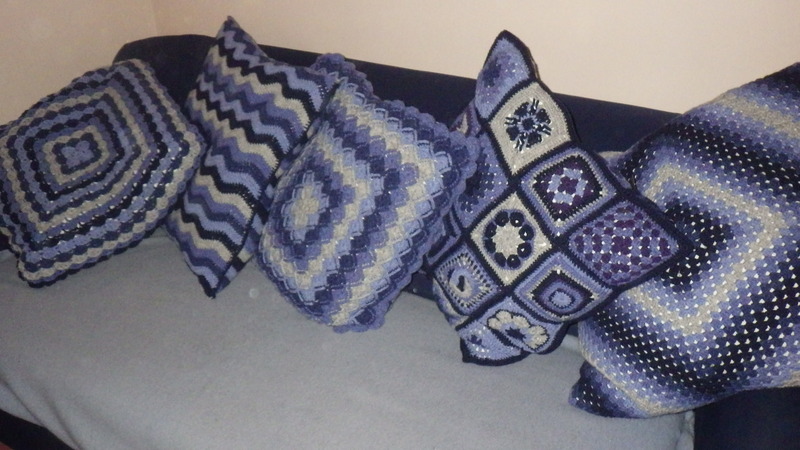 However, I haven’t thrown them out and I’m wondering whether to get someone to put new zips in the cushion covers. I am not a good enough seamstress to do it myself, but there are one or two local ladies who do repairs. Then I could spruce them up with some applique or embroidery so that I have spare covers when the wool ones need washing. Yes, it’s always good to have spares or rotate for a change. I bet someone would be happy to put the new zippers in. Good luck! 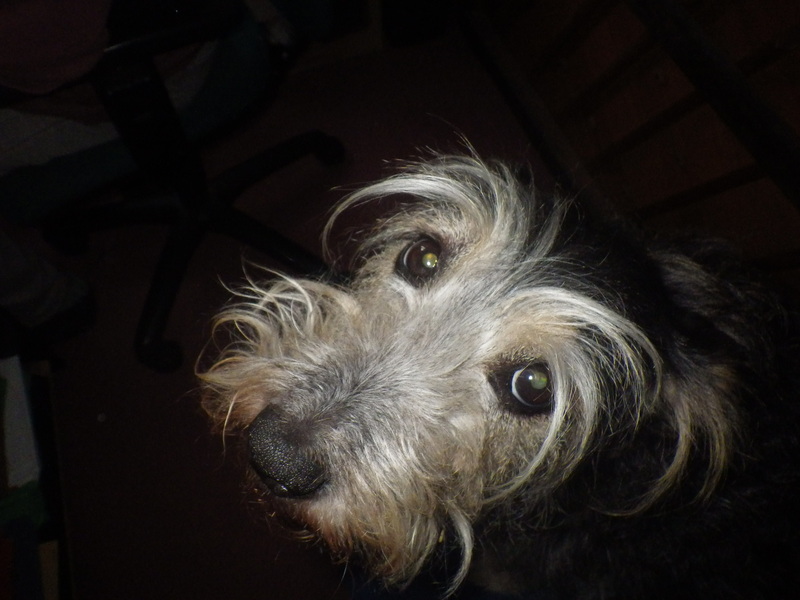 Sam is indeed ornery… it’s not a word we use much in the UK, but it suits her down to the ground. It’s not a word used much in the Pacific Northwest either. Mostly from the southern and mid west areas. Since I’m a gypsy, I pick up language from everywhere. 🙂 He does look like a love though. What a great photo of that naughty Sam! I hope he never develops a taste for crochet . . .
Fortunately neither Sam not Max have showed any interest in yarn – mind you they have had it drummed into them that any balls of yarn or knitting or crochet are completely off-limits. I have no idea where the taste for zips came from – it’s only appeared in the last couple of years. it is going to be lovely!